Come Dance With Me ws Mr. Sinatra's best selling album of his career, and stayed on Billboard's Pop album chart for 140 weeks, peaking at #2. Mack the Knife was the biggest hit of 1959 and of Bobby's career. The Chiffons, Ben E. King, Charlie Rich, Harold Melvin and the Blue Notes, Ferrante & Teicher, Ike and Tina Turner, Etta James and Bob Crewe. Annual Best Music Hits Here ! One Hit Wonders include artists with only one song in Billboard's Music Charts, songs of note and well-known hits that did not even make the Billboard Pop Charts. 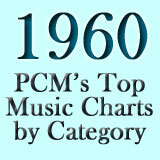 PCM Charts are based on DJ requests and online suggestions. Compromising that data, we try to list songs for the year they saw the most chart action.